*WINNER of BEST BUSINESS BOOK, International Book Awards* Every purchased copy of the book includes access to the free downloadable Invisible Advantage Toolkit! 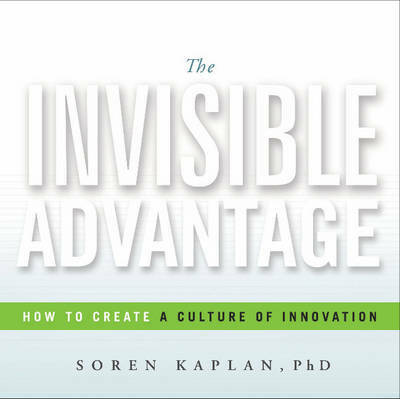 The Invisible Advantage shows how any organization can create a culture of innovation--an environment that promotes freethinking, an entrepreneurial spirit, and sustainable value creation at all levels and across all functions. This book isn't just about the importance of an innovation culture, nor how to emulate the ''innovation untouchables'' like Google and Apple. It's a complete tool kit that anyone can use to uncover the unique, hidden drivers of innovation and then introduce fresh, intuitive approaches tailored to their organization's specific environment. To get the free Invisible Advantage Toolkit, email your receipt to toolkit@leapfrogging.com to get a download link that contains: 1. Free Video: Download the Culture as Competitive Advantage video to help make the business case for creating a culture of innovation. 2. Free Questionnaire: Get proprietary survey questions to assess your current culture of innovation. 3. Free Interview Guide: Get proven interview questions to engage key stakeholders in 1:1 discussions to assess culture and build momentum for change. 4. Free PDF Poster: Get a Large Format PDF Poster that you can print to help facilitate working sessions to design your own culture of innovation. 5. Free PowerPoint Template: Use the PowerPoint Template to define and communicate your current-state and future-state culture of innovation.